The educational attainment of young adults in Louisville lays the groundwork for the academic outcomes of future generations. An educated workforce is also important to establishing 21st-century jobs to make Louisville competitive in the modern economy. College attainment among young adults is an important indicator of the effectiveness of Louisville’s educational system and its ability to attract educated workers from other cities. Louisville currently ranks 7th among its peer cities with 49.2% of young adults having earned at least an associate degree. Louisville is in the top of its peer group according to a natural breaks algorithm. Cities in green are those that outperform their peers, cities in yellow represent the middle cluster, and those in red are a group that lags behind its peers on this indicator. Where in Louisville are associate degrees and above found? Although many working adults in Louisville have an associate degree or higher, there is a clear geographic divide on where those people live. In the map to the left, areas where more adults have associate degrees or higher are purple, while areas where fewer adults hold associate degrees or higher are white. High attainment of post-secondary degrees is almost exclusively seen in eastern Louisville, among communities such as the Highlands, Clifton, and Crescent Hill where the highest percentage reaches 75%. In comparison, western and southern Louisville communities earned fewer post-secondary degrees, with the lowest rate being 8% in Russell and Fairdale. 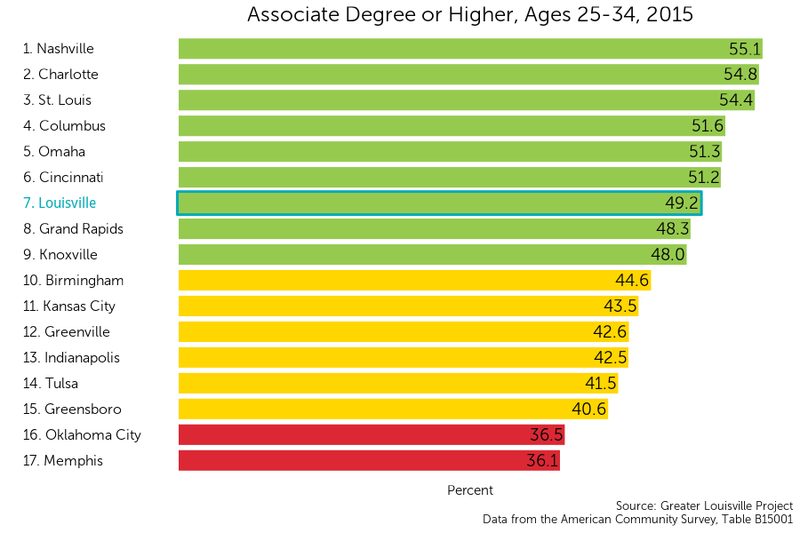 The percentage of young adults with degrees in Louisville has increased since 2011, raising Louisville above its peer city mean and ending years of stagnation.Continuing to increase the number of young adults with degrees at the current rate would raise Louisville’s standing compared to its peers and give young adults the foundation for a successful career.